Almost two weeks ago now we photographed and reviewed a secret concert held in a former train garage, which featured the musical stylings of Wale, Melanie Fiona, Santigold, and DJ Maseo of De La Soul. Well, at long last, the exclusive + high quality video content from the night is available for those looking to re-live some of the night’s highlights, and those who weren’t fortunate enough to attend. My personal favourite is the video above, and is without a doubt the most exciting moment of the evening. 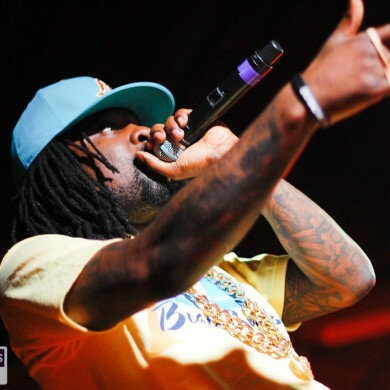 The video stars Wale and Melanie Fiona performing their collaborative effort ‘Beautiful Bliss’. The Fader couldn’t have said it better: Melanie Fiona absolutely owns it on stage “channeling a young Mary J. Blige”, while Wale delivers his usual smooth vocal performance and hypes the crowd in to a frenzy. You can watch the extensive + exclusive uncapped concert series video content on the vitaminwater YouTube channel. There are several more dates and a good deal more content to come!